Madison Lane Interiors: What's different about a dining room? What's different about a dining room? If you have a separate dining area you know the issues I'm about to mention. Most of these rooms are on the front of the house, so the window is visible to everyone driving by. If this window faces the west you may need a more than one line of defense against the setting sun (since most dinners will be during this time). Another issue is how to warm up a room that has so many wooden pieces in it and very little upholstery. An area rug may help, but if you pass through part of your dining room into the next room, the corner of a rug might end up running into the middle of the traffic area. Or if your room is narrow, it could cause a problem with a hutch or sideboard. 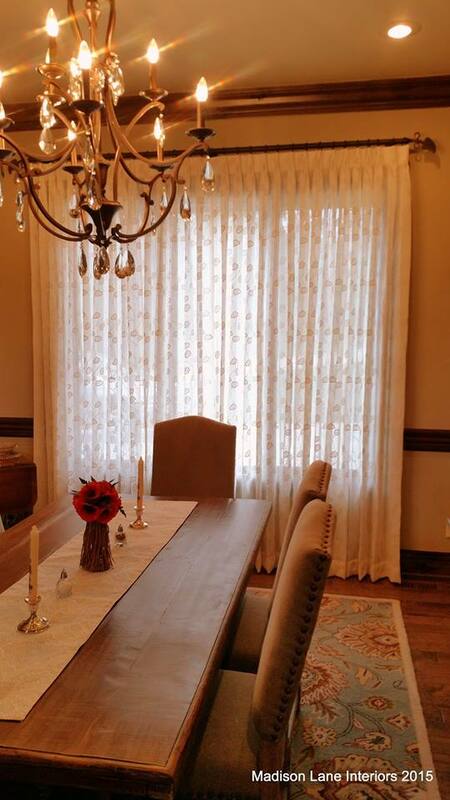 One of the best places to use floor length drapery ends up being in a dining room. It can solve several of these issues. First one is that it adds some softness to an otherwise "hard" room. Another reason is to filter the sunlight and provide privacy (or at least semi-privacy as shown above). 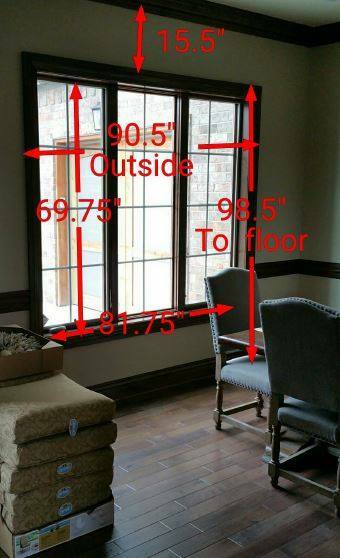 Other rooms have upholstery and small tables that may be hard to place if a floor length panel is in the way, but a dining room doesn't seem to have this problem. We know all the measurements we need to take and how to determine the type of drapery hardware you will need, too. If you thought talking about pinch pleats, returns, leading edges and lining was difficult, wait until we start telling you all the hardware options! There are so many styles and colors available, but by the time we determine your "needs" it will start limiting all of those choices into something more manageable. 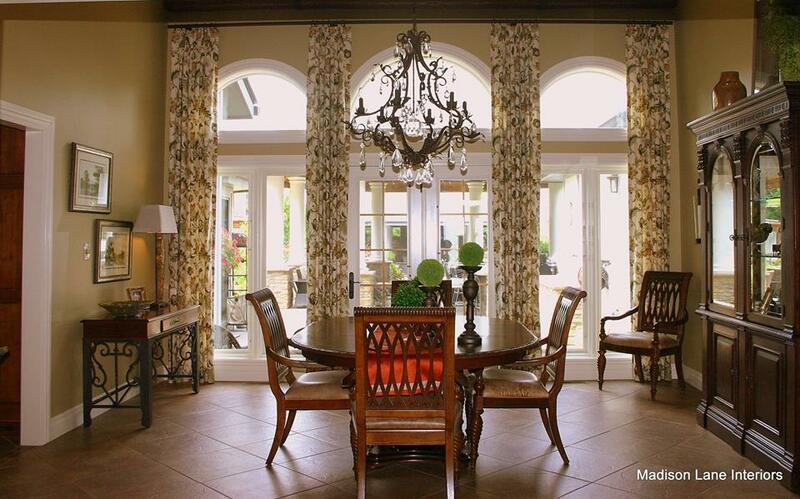 Come by and tell us what is different about your dining room. We'll solve your problems and find the best look for your decorating style.